At just 16, the latest American swim sensation Melissa Franklin made quite an entrance when claiming three gold medals at the 2011 world championhips at Shanghai and needless to say a great deal is now being expected from 'Missy' at the 2012 London Games. It would seem she'll also play a key role in the relays and will bid for gold in the backstroke races as well as the relays after Franklin won three of her five medals in the 4x200m freestyle and 4x100m medley as well as taking silver in the 4x100m freestyle. On top of that she picked up individual titles in the 200m and 50m backstroke races. This Shanghai surprise had been on the cards since she took two silver medals in the Dubai 2010 short-course world championships in the 200m backstroke and the 4x100m medley (where in fact she did not swim the final). A great deal of ink has been spilled since these two events and Franklin has been thrust into the spotlight, though she hates tv interviews and being in the media spotlight. And given her lofty stature of 6ft 2in and size 10 shoes, a bit of discretion is hardly a bad thing. Two days after her return from China, Franklin won the 100m backstroke at the American national championships at Palo Alto in California. Three days later she took the 100m freestyle national title with a chrono of 53.63sec, which would have won her a bronze in Shanghai. 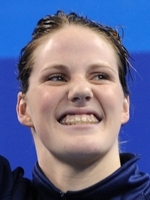 And yet Franklin's fabulous 2011 was to continue in style at Berlin in October at the world short-course championships where she would break the 200m backstroke record setting a new time of 2min 00.03sec. In December, she broke another one, this time the 4x100m medley alongside Natalie Coughlin, Rebecca Soni and Dana Vollmer in 3min 45.56secs during the so-called 'Duel in the Pool ' competition against Europeans. The new mark sliced an impressive 2.41sec off the old one. Her father says of her that she'll be larking around with the other girls until she's in a race when her focus becomes total. He was an American footballer himself and will understand the importance of this asset. Both parents were born in Canada and her mother had suggested Missy race for Canada. The American team will be delighted it worked out otherwise.